High on the slopes of Mount Zao in Kaminoyama, Yamagata Prefecture lies the village of Furuyashiki, with only eight homes and their residents. The film unfolds like a grand historical scroll depicting the country “Nippon,” with a single mountain village as its stage. 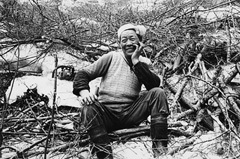 The first half of the film presents an exhaustive scientific survey to elucidate the causes of rice crop damage from cold weather, while the second half traces the personal history of elderly residents who talk about the charcoal-making that once thrived in the village and their experiences of conscription and war. The guiding spirit of YIDFF since its founding, director Ogawa Shinsuke and the film crew themselves farmed while making this masterpiece. Born in Tokyo in 1936, Ogawa began working as an assistant director at Iwanami Productions in 1960, and participated in the Ao no Kai (Blue Group) film study group with Higashi Yoichi, Iwasa Hisaya, Kuroki Kazuo, Tsuchimoto Noriaki, and others. He went freelance in 1964 and made his first film, Sea of Youth (1966), followed by Report from Haneda (1967) and others. His films won support at workplaces and universities throughout Japan in the midst of the Zenkyoto student movement. He founded Ogawa Productions in 1968 and immersed himself in the production of the Sanrizuka series, which depicted the movement of farmers in opposition to the construction of Narita International Airport. Continuing to make films from the standpoint of farmers, in 1974 Ogawa moved to the village of Magino in Kaminoyama, Yamagata Prefecture, where he filmed A Japanese Village—Furuyashikimura (1982) and Magino Village—A Tale (1986), while growing rice and observing life in farming villages. His dedicated work as an organizing member of the first YIDFF in 1989 was instrumental to the festival’s success. He passed away on February 7, 1992. Furuyashiki Village in Kaminoyama, Yamagata Prefecture is where director Ogawa Shinsuke shot the documentary A Japanese Village—Furuyashikimura. Few people live there now, and the traditional thatched-roof houses that appear in the film are deteriorating by the day. In order to preserve the traditional Japanese landscape of the village, to rediscover the local history and way of life, and to create a platform for new cultural exchanges, the Committee to Preserve Furuyashiki Village was founded in November 2008. The committee provides opportunities for concerned citizens to participate in the restoration of Furuyashiki Village. In addition to organizing events to inform people about the village’s status and appeal for their participation, the committee has begun working by hand, cutting trees from the forest, stripping bark, and harvesting thatch to preserve old farmhouses.